I love those sassy ladies of R & B who take no nonsense from their men, know what they want and make damn sure they get it. As you can tell from these tracks, Betty Bibbs seems to have been a member in good standing of that particular club. 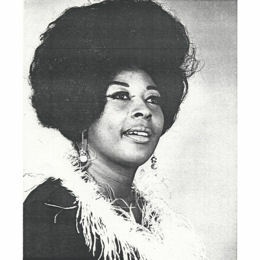 Her early Chi-town cuts weren’t up to much, the best being an underproduced version of Bobby Bland’s “If You Could Read My Mind", but her later recordings straddling the line between blues and soul were ever so much better. 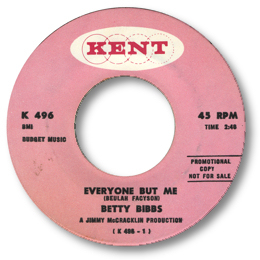 A session on the West Coast produced by Jimmy McCracklin made a fine 45 on Kent. The boasting bluesy toe-tapper “Enough For Everybody” is good but the ballad Everyone But Me is in a different league. After a dramatic opening instrumental flourish Betty comes in weaving her way through a stop-go tour de force. The two unissued cuts from the same session confirm her strong vocal style. The dancer's favourite “Pounds Of Soul” has a some tasty piano fills behind Betty’s committed singing, and the blue tinged slowie “First Come First Served” is an early version of a song she later recut for Geneva. 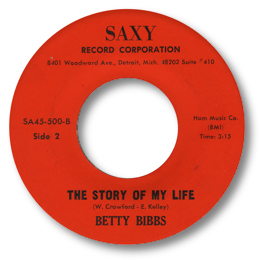 I don’t know which of the other two 45s by Betty came first, but my guess is the excellent double sider for Saxy. And don’t be fooled by the fact that both 45s have Detroit addresses – at least 3 of the 4 tracks were recorded down south. The Saxy is one of the great unknown Memphis discs, cut at Hi, and featuring the usual superb musicianship of the session men there. Who’s Gonna Take Care Of Me is one of those great chugging midpacers that the Hodges Brothers and the Memphis Bulldog specialised in, and The Story Of My Life is a first class example of southern soul, deep, with some lovely male harmonies. 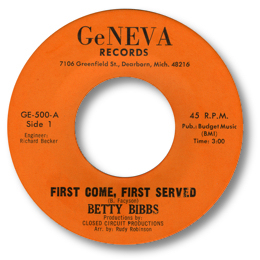 The Geneva disc is another fine double sided effort, both sides giving full rein to Betty’s hard edged vocalising. The midpaced “I Want Some Satisfaction” is a real strutting grower, and the issued version of First Come First Served hits all the right spots. I’d put a lot of money on this side being cut at Hi as well - maybe even from the same session as the Saxy release. Those horns couldn’t have come from anywhere else, and the drummer is certainly Howard Grimes. In any event this bluesy deep ballad is a track that all deep fans should own. The writer’s credit for a fair chunk of her work is given to Beulah Facyson – could this be Betty’s real name? No it isn't, it's producer Jimmy McCracklin's wife! UPDATE ~ Dave Porter writes (see Links) that Betty's real name is Betty J Batiste. FURTHER UPDATE ~ Marc Demuynck writes to add some more details on Betty which he found in an old copy of Blues Unlimited - 'M.C. Reeder's T-99 Club' / Interview with Stella Reeder by Bill Greensmith in 'Blues Unlimited' # 144 - Spring 1983 - p 22'. It turns out that Betty Bibbs' dad is M.C. Reeder,the flamboyant owner of the legendary 'T-99 Club' in Osceola,AR. "B G: Were you the youngest? S R: Well you know what,with my dad I couldn't tell ya! (laughing).The only thing I could tell you is that I was very close to him more than any of the other kids.I've got a half sister named Betty Bibbs,well let's see she's Betty Bibbs,Batiste,Morris,Service,oh Benson.I forgot that one and Reeder that's her maiden name and she's a singer in L.A."
It's a shame that Bill Greensmigh didn't follow up this line of questions - but I don't know of any 45s by Betty under these other names that are mentioned. And neither does Marc. "Betty J. Bibbs passed away April 8,2009 in Compton,L.A. County,California. Date of birth: March 18,1941 in Osceola,Mississippi County (Source: 'Blues: A Regional Experience' by Bob Eagle and Eric S. LeBlanc - p. 165)"
I'm grateful to Marc for this excellent find - and of course to Bill Greensmith. Also to Bob & Eric whose book noted above is simplay a "must have". Further info on this volume will be posted on the website soon. Note ~ The entire Kent session has been reissued on various Kent UK CDs. “Pounds of soul”, “Everyone but me” and "First come first served” on “Pounds of soul” (CDKEND 217) and “Enough for everybody” is on “For connoisseurs only vol 2” (CDKND 251). Many thanks to Dave Porter for the great info and the wonderful picture. Also to Alasdair Blaazer for the info on Jimmy McCracklin and his family.